Stately and elegant, the Zup Director Office Chair provides both form and function for a contemporary home or work office space. This striking chair�s clean lines, attractive artistry and comfortable seating make it a perfect spot for facing a long work day. The Director�s base is crafted from lightweight, yet sturdy aluminum, which is polished for added shine. The seat and back feature quality faux leather upholstery, giving the chair an upscale, sophisticated look and a soft and supple feel. 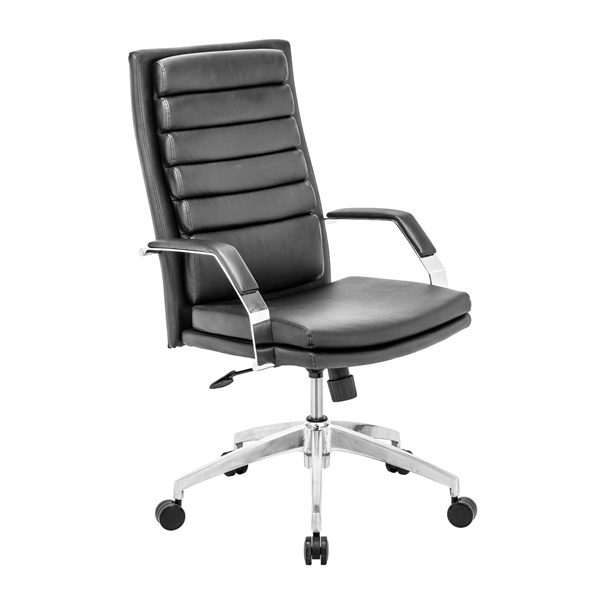 Generous padding and a contoured back add just the right amount of comfort to get you through the work day, and five caster wheels allow the Director to glide seamlessly around the office, with little effort. Meanwhile, striking lined back accents add a fresh, bold look. Available in your choice of colors.